The manufacturing sector consumed 2 172 petajoules of energy as part of the production process in 2017, up 1.8% from 2016. 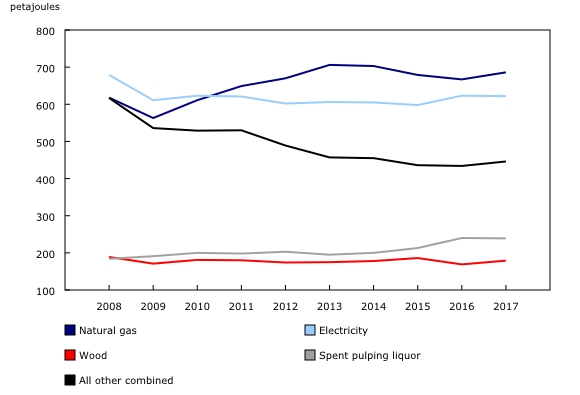 Natural gas (31.6%) was the largest source of energy consumed in the production process in 2017, followed by electricity (28.6%), spent pulping liquor (11.0%) and wood (8.2%). Other energy sources combined accounted for the remaining 20.6% of the total energy consumed. Prior to 2011, electricity was the largest source of energy consumed by the manufacturing industry. Natural gas became the most consumed energy in 2011 and has since grown at a faster pace than electricity. From 2009 to 2017, natural gas consumption rose by 21.8% while electricity consumption grew by 1.8%. Over this same period, the consumption of spent pulping liquor (+25.1%) and wood products (+4.7%) increased, while all other fuels combined (-16.7%) declined. In 2017, the top consumers of energy were paper (26.1%), primary metal (23.0%), petroleum and coal products (14.0%) and chemical (12.3%) manufacturers, which combined accounted for 75.5% of the total energy consumed. Natural gas was primarily consumed by chemical (25.6%), primary metal (18.6%) paper (12.2%), and food (10.0%) industries, accounting for 66.4% of the natural gas consumed by manufacturing industries. The largest consumers of electricity were the primary metal (38.9%) paper (22.4%), chemical (10.8%), food (5.5%) and wood product (4.0%) manufacturers, accounting for 81.6% of the total electricity consumed in the production process. Spent pulping liquor was only consumed by the paper manufacturing industry, while the largest consumers of wood and wood waste were the paper (50.3%) and wood products (47.4%) manufacturing industries. The Industrial Consumption of Energy Survey, sponsored by Natural Resources Canada and Environment and Climate Change Canada, estimates energy consumed by type of fuel in Canadian manufacturing. The target population consists of Canadian establishments classified by the North American Industry Classification System (NAICS) to manufacturing sectors 31, 32 and 33. The 2017 survey estimates are based on a sample of 4,702 manufacturing establishments, which represents a weighted response rate of 90.8%. A joule is a derived measure of energy or work. One gigajoule is equal to one billion (109) joules and six gigajoules are roughly equivalent to the amount of potential energy in one US standard barrel of oil when consumed. 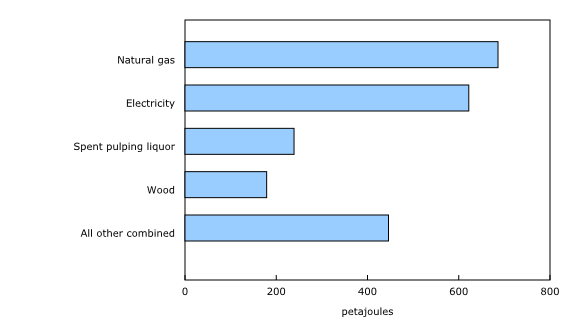 One petajoule is equal to 1015 joules. Other energy sources include butane; coal; coal coke; coke oven gas; heavy fuel oil; middle distillates; petroleum coke and coke from catalytic cracking catalyst; propane; refinery fuel gas; and purchased steam. Electricity consists of both purchased and self-generated electricity. Totals and percentages may not add up due to rounding. Data for 2016 have been finalized, while data for 2017 are subject to revision.